The four letter words, my friends, are blowin' in the wind. Happy 70th birthday to Bob Dylan. And some thoughts about blowing wind. When I was younger, I heard some people singing the song Blowin' in the Wind, and naively answered "42". But the song lingered with me. I still think of it from time to time - with all the challenges we have, with all the problems we have to face, where do we find the answers? They're out there - if we can catch them and hold onto them. It becomes even more poignant as I think about the severe weather systems that seem to be occurring more and more frequently. I've been through hurricanes and tornados, and although one can talk wind speeds and classifications... such things are meaningless when they affect you... and there is no solid measure of that. 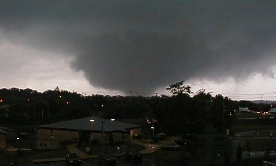 Here's a picture I took about 10 years ago... just moments before I realized that what was coming at me was a tornado. It missed the apartment I was in - quite thankfully, since I was on the fourth floor at the time. This was a tiny tornado, as such things go. There was damage... and a few casualties. But except for a week without power, I was mostly unaffected. I can only imagine the people right now in Joplin and elsewhere who are seeking answers. Answers that were blowing in the wind.